The Collegiate Readership Program gives undergraduate students daily access to the New York Times, USA Today, and Pittsburgh Post-Gazette at a number of campus locations. The goal of CRP is to encourage community and global awareness, thereby enhancing the learning environment and better preparing students for life after graduation. There are two types of bins on campus: closed and open bins. Open bins are most often used in dorms and other areas with high undergraduate traffic to ensure that it is chiefly undergrads, those paying the Media fee, that are using the program. Closed bins are found in areas shared by undergraduate students, graduate students, and faculty so that newspapers can only be taken by the undergrads. 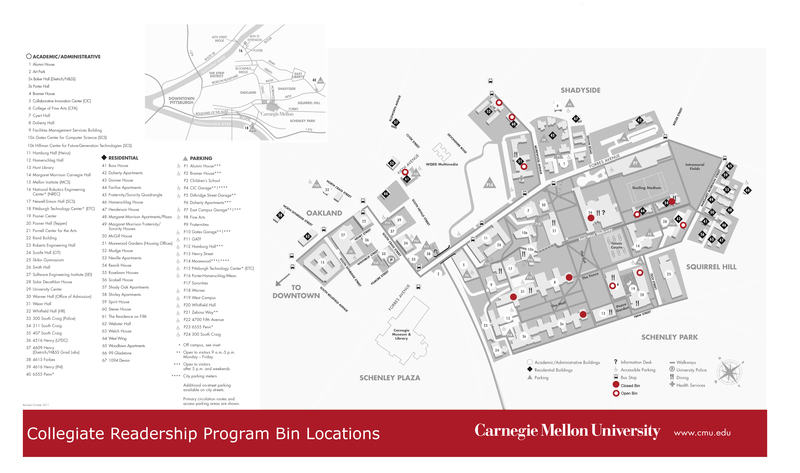 Simply swipe your Carnegie Mellon ID to gain access to a closed bin. CRP is financed by the Media fee, a $5 addition to undergraduate tuition each semester. Carnegie Mellon only pays for newspapers that are taken by students; it does not pay for any newspapers that are left over at the end of the day. There is a referendum held every 4 years to ask the student body if they wish to continue paying the Media fee for CRP. In the 2011 Spring General Election, over 85% students voted to continue the program, demonstrating very strong support for CRP. The New York Times has launched a new facet of the Collegiate Readership Program called “Academic Passes.” An Academic Pass gives students complimentary 24 hour access to the NY Times Online and all related apps. To claim a pass, visit nytimes.com/passes and register with your Andrew email. We in Senate believe that Academic Passes will lead our Collegiate Readership Program into the future, encouraging a new generation of CMU students to be informed about happenings across the globe. The Collegiate Readership Program is under the jurisdiction of the Undergraduate Student Senate and is overseen by a liaison who communicates with representatives from the newspapers and student activities. The current CRP liaison is junior statistics major Vinay Viswanathan, who can be reached via email. We are constantly working on improving and adding bin locations on campus. We are also looking into a greater CRP presence during Orientation week, as well as better advertising to increase the awareness of the program. If you have any questions, comments, or suggestions, please feel free to contact us! For information on the Collegiate Readership Program nationwide, go to http://www.usatodayeducate.com/staging/index.php/collegiate-readership-program-overview.